<h2>The robots being readied to enter nuclear no-go zones</h2><br /><p>When Japan’s Fukushima nuclear disaster struck in 2011 following a devastating earthquake and tsunami, the robots that were deployed to support rescue workers were very basic and largely ineffective, says robotics expert Professor Sven Behnke at the University of Bonn in Germany.</p> <p>Spurred by this problem, Prof. Behnke and his team developed a robust disaster-response system through a project called <a href="https://cordis.europa.eu/project/rcn/194249/factsheet/en">CENTAURO</a>. The robot is controlled by a human from a safe distance while various sensors allow it to perceive its environment and relay information back to its operator.</p> <p>‘The main operator controls the robot through a telepresence suit which measures the motions of the operator's arms, wrists and fingers and transfers them to the robot,’ said project coordinator Prof. Behnke. A head-mounted display worn by the operator allows them to see in 3D what the robot sees from its own perspective, he adds.</p> <p>Named Centauro, the 1.5-metre-tall robot weighs 93 kilograms, is made of lightweight metals like aluminum and has 3D-printed plastic skin.</p> <p><strong>Centaur-like</strong></p> <p>‘The robot has a centaur-like body plan with four articulated legs ending in steerable wheels,’ said Prof. Behnke. Those four legs make it more stable than bipedal robots. As it is able to rotate at the hip, knee and ankle, Centauro can take on numerous postures and navigate in challenging environments.</p> <p>Centauro’s upper body has two arms with multi-fingered hands which allow it to lift objects and manipulate tools and doors. Although tele-operated, the robot has some degree of autonomy. For example, if it is told to move to specific locations or grasp an object it will plan and execute the action.</p> <p><img class="@alignleft@" title="Tele-operated robot Centauro can fulfil tasks such as climbing stairs, navigating obstacles and using power tools. 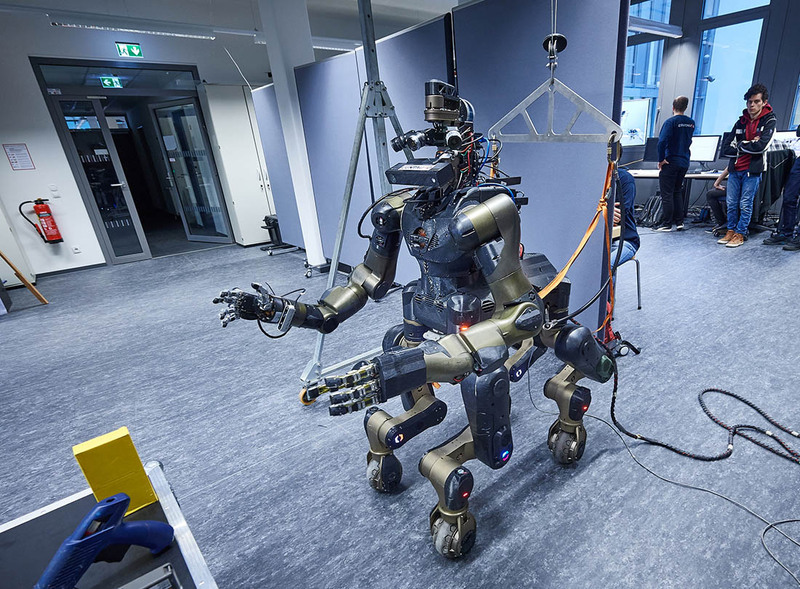 Image Credit - © Volker Lannert/Uni Bonn" src="https://horizon-media.s3-eu-west-1.amazonaws.com/s3fs-public/IMCEUpload/centauro_hand_robot.jpg" alt="Tele-operated robot Centauro can fulfil tasks such as climbing stairs, navigating obstacles and using power tools. Image Credit - © Volker Lannert/Uni Bonn" width="1400" height="966" /></p> <p>Last year, Centauro was tested in real-world, challenging scenarios at the German nuclear disaster-response provider Kerntechnische Hilfsdienst GmbH. It successfully climbed stairs, navigated debris, overcame gaps, unlocked a door, operated valves and power tools, and more, says Prof. Behnke. ‘The CENTAURO disaster-response system provided the high degree of flexibility needed for realistic missions,’ he said.</p> <p>Prof. Behnke hopes the technology&nbsp;may one day play a crucial role in disaster relief efforts although&nbsp;it&nbsp;isn’t ready to face radiation just yet. However, researchers at the University of Birmingham, UK, are in the process of developing robots that can handle high radiation levels to clean up nuclear waste from the past half century.&nbsp;</p> <p>Across the European Union, more than <a href="https://ec.europa.eu/energy/en/topics/nuclear-energy/decommissioning-nuclear-facilities">90 nuclear reactors</a> have been permanently shut down while more facilities are set to be decommissioned. Under its 2021-2027 budget, the European Commission has proposed to allocate nearly&nbsp;<a href="https://ec.europa.eu/info/news/continued-budgetary-support-nuclear-safety-and-decommissioning-proposed-commission-2018-jun-13_en">€1.2 billion</a>&nbsp;towards nuclear safety.</p> <p>‘There’s nearly five million tonnes of legacy nuclear waste in the UK and cleaning that up is the biggest and most difficult environmental remediation challenge in the whole of Europe,’ said robotics expert Professor Rustam Stolkin who coordinates the <a href="https://cordis.europa.eu/project/rcn/194336/factsheet/en" target="_blank" rel="noopener noreferrer">RoMaNs</a> project.</p> <p>Prof. Stolkin and his colleagues are designing autonomous behaviours in robots so that they can sort radioactive waste according to various contamination levels.</p> <p>‘This can only be done by robots because this waste is too radioactive for humans to go near, even (when) wearing protective suits,’ said Prof. Stolkin.</p> <p><img class="@alignleft@" title="In 2013, the most recent year for which figures are available, France had nearly 1.5 million cubic metres of radioactive waste, 44% of the bloc’s total. The UK was second with more than 1.2 million cubic metres, 38% of the total EU volume. " src="https://horizon-media.s3-eu-west-1.amazonaws.com/s3fs-public/IMCEUpload/NuclearWaste-02.png" alt="In 2013, the most recent year for which figures are available, France had the most radioactive waste in the EU with nearly 1.5 million cubic metres, 44% of the bloc’s total. 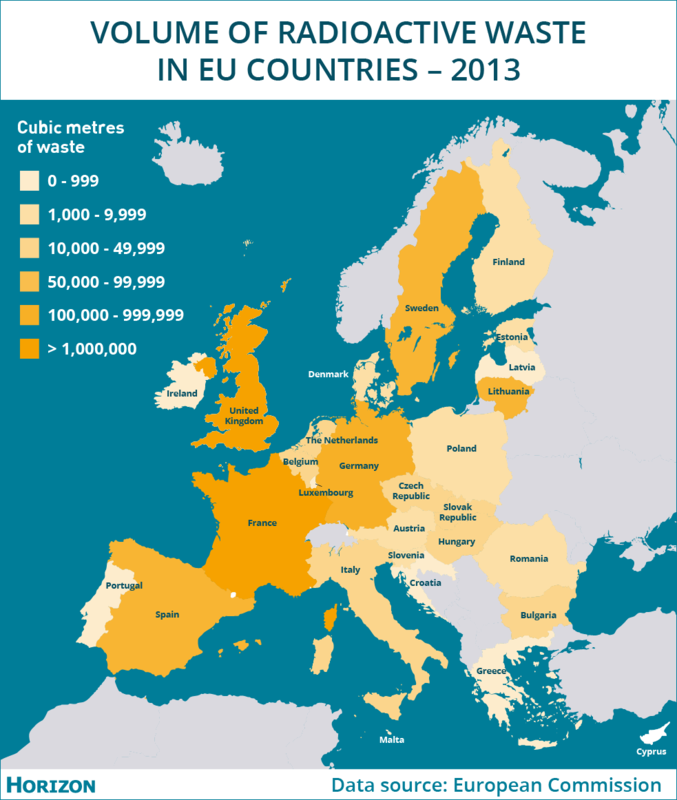 The UK had the second largest amount with more than 1.2 million cubic metres, 38% of the total EU volume. " width="983" height="1162" /></p> <p><strong>AI-controlled</strong></p> <p>To date, robots operating in dangerous environments are controlled entirely by a human, but this one-way approach would be painstakingly slow for grasping and moving huge amounts of materials of unpredictable shapes, sizes and consistencies, says Prof. Stolkin.</p> <p> <div class="quote-view quotesBlock quote_horizontal"> <div class="quotesTop"><img src="https://horizon-magazine.eu/sites/all/themes/horizon/images/quotes_top.png" alt="" title="" /></div> <p>‘There’s nearly five million tonnes of legacy nuclear waste in the UK and cleaning that up is the biggest and most difficult environmental remediation challenge in the whole of Europe.’</p> <blockquote><p>Professor Rustam Stolkin, University of Birmingham, UK</p></blockquote> <div class="quotesBottom"><img src="https://horizon-magazine.eu/sites/all/themes/horizon/images/quotes_bottom.png" alt="" title="" /></div> </div> </p> <p>To overcome this problem, the team developed an autonomous, vision-guided robot which uses AI to assist the human operator.</p> <p>Their project partner CEA, the French Alternative Energies and Atomic Energy Commission, created a nuclear-resilient robot arm with a hand and fingers, which is controlled by a robotic glove, or haptic exoskeleton, worn by the operator.</p> <p>‘This now is a bit like a fancy joystick,’ explained Prof. Stolkin. ‘So as you move your arm and your fingers, the slave arm in the radioactive zone moves its arm and its fingers.’</p> <p>The system uses AI for automatic vision, allowing the robot to know how to detect, recognise and pick up all kinds of objects.</p> <p>The human operators share control of the robotic arm with the robot through tele-operation and AI, says Prof. Stolkin. For example, the operator can move the arm around and the robot automatically controls the orientation of the hand to make the grasp easier, or the robot, planning to grasp an object, would display its intentions to the human for confirmation.</p> <p>‘The robot (AI) is doing all the hard work, but the human still feels in charge at some level,’ he said.</p> <p>Such systems are usually very complex to control, says Prof. Stolkin, however theirs allows operators to simply mouse click on an object that the robot goes to and grasps.</p> <p><img class="@alignleft@" title="The three-fingered hand exoskeleton developed by CEA captures the operator's movements to control the slave robot hand. Image Credit - CEA / Stroppa" src="https://horizon-media.s3-eu-west-1.amazonaws.com/s3fs-public/IMCEUpload/exorobot.jpg" alt="The three-fingered hand exoskeleton developed by CEA captures the operator's movements to control the slave robot hand. Image Credit - CEA / Stroppa" width="1800" height="1198" /></p> <p>When the robot arm touches a surface or grasps an object, the operator feels the contact forces through the robotic glove. Giving remote operators situational awareness of what’s going on inside the no-go zone through a virtual sense of touch is extremely useful, says Prof. Stolkin.</p> <p>For the gloves to work, the robot arm must behave adaptively, responding to the environment they encounter, he says. To achieve this, the CEA team developed adaptive mechanisms in the arm joints that mechanically move just like springs and are more resilient against radiation than delicate electronic parts.</p> <p><strong>Near future</strong></p> <p>The RoMaNs team successfully tested a robot arm with the AI control system they developed, in a radioactive environment in 2017, under full nuclear safety and UK national security regulations, at a site in northern England operated by the National Nuclear Laboratory. This was the first time ever an AI-controlled robot was deployed into a real-world, radioactive environment.</p> <p>Prof. Stolkin had previously imagined that it may take at least another decade to transfer these technologies to the nuclear industry, but says plans are already being made to deploy them at decommissioning sites in the near future.</p> <p>‘When we proposed this, the idea of AI-controlled robots, it was considered absurd by this industry,’ he said.</p> <p><em>The research in this article was funded by the EU. If you liked this article, please consider sharing it on social media.</em></p> <br /> <img src=”http://www.google-analytics.com/collect?v=1&tid=UA-40077089-1&cid=the-robots-being-readied-to-enter-nuclear-no-go-zones&t=event&ec=republish&ea=read&el=the-robots-being-readied-to-enter-nuclear-no-go-zones&cs=republish&cm=republish&cn=republish&cm1=1" /> This post <a href="https://horizon-magazine.eu/article/robots-being-readied-enter-nuclear-no-go-zones.html">The robots being readied to enter nuclear no-go zones</a> was originally published on <a href="https://horizon-magazine.eu/">Horizon: the EU Research &amp; Innovation magazine | European Commission</a>. Robust, intelligent robots that react to their surroundings are being developed to work in situations that are too dangerous for humans, such as cleaning up Europe’s decades-old radioactive waste or helping during a nuclear emergency. When Japan’s Fukushima nuclear disaster struck in 2011 following a devastating earthquake and tsunami, the robots that were deployed to support rescue workers were very basic and largely ineffective, says robotics expert Professor Sven Behnke at the University of Bonn in Germany. Spurred by this problem, Prof. Behnke and his team developed a robust disaster-response system through a project called CENTAURO. The robot is controlled by a human from a safe distance while various sensors allow it to perceive its environment and relay information back to its operator. 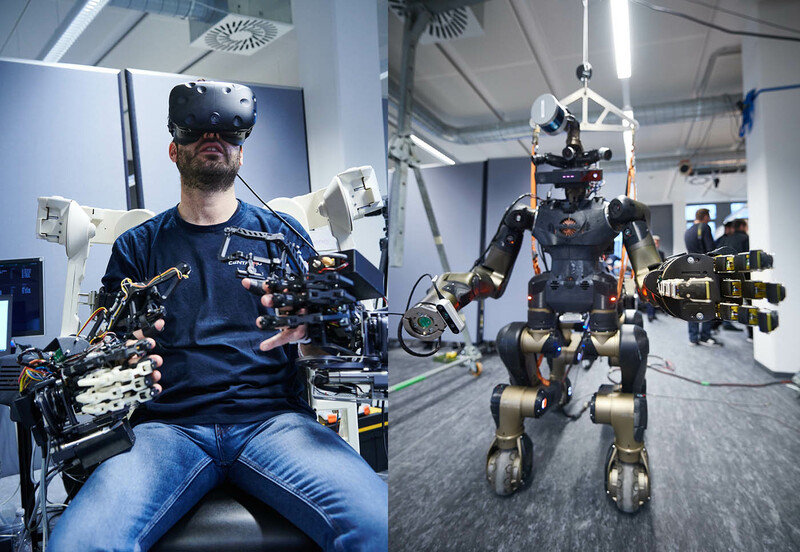 ‘The main operator controls the robot through a telepresence suit which measures the motions of the operator's arms, wrists and fingers and transfers them to the robot,’ said project coordinator Prof. Behnke. A head-mounted display worn by the operator allows them to see in 3D what the robot sees from its own perspective, he adds. Named Centauro, the 1.5-metre-tall robot weighs 93 kilograms, is made of lightweight metals like aluminum and has 3D-printed plastic skin. ‘The robot has a centaur-like body plan with four articulated legs ending in steerable wheels,’ said Prof. Behnke. Those four legs make it more stable than bipedal robots. As it is able to rotate at the hip, knee and ankle, Centauro can take on numerous postures and navigate in challenging environments. Centauro’s upper body has two arms with multi-fingered hands which allow it to lift objects and manipulate tools and doors. Although tele-operated, the robot has some degree of autonomy. For example, if it is told to move to specific locations or grasp an object it will plan and execute the action. Last year, Centauro was tested in real-world, challenging scenarios at the German nuclear disaster-response provider Kerntechnische Hilfsdienst GmbH. It successfully climbed stairs, navigated debris, overcame gaps, unlocked a door, operated valves and power tools, and more, says Prof. Behnke. ‘The CENTAURO disaster-response system provided the high degree of flexibility needed for realistic missions,’ he said. Prof. Behnke hopes the technology may one day play a crucial role in disaster relief efforts although it isn’t ready to face radiation just yet. However, researchers at the University of Birmingham, UK, are in the process of developing robots that can handle high radiation levels to clean up nuclear waste from the past half century. Across the European Union, more than 90 nuclear reactors have been permanently shut down while more facilities are set to be decommissioned. Under its 2021-2027 budget, the European Commission has proposed to allocate nearly €1.2 billion towards nuclear safety. ‘There’s nearly five million tonnes of legacy nuclear waste in the UK and cleaning that up is the biggest and most difficult environmental remediation challenge in the whole of Europe,’ said robotics expert Professor Rustam Stolkin who coordinates the RoMaNs project. ‘This can only be done by robots because this waste is too radioactive for humans to go near, even (when) wearing protective suits,’ said Prof. Stolkin. 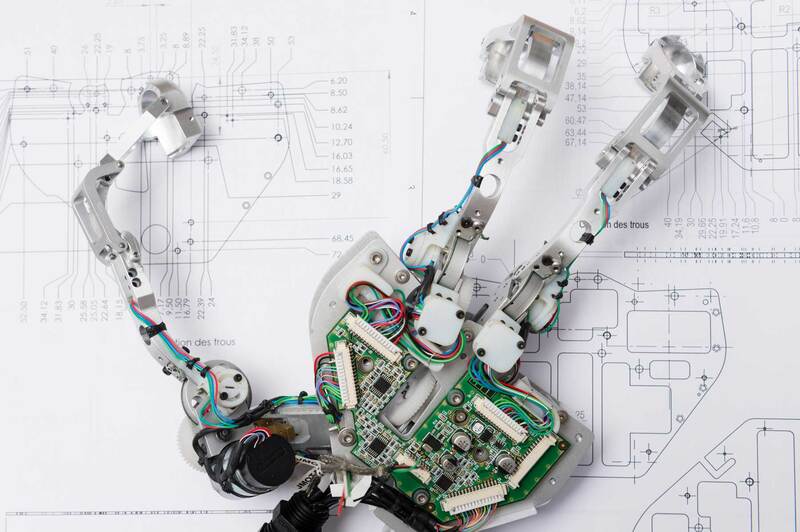 To date, robots operating in dangerous environments are controlled entirely by a human, but this one-way approach would be painstakingly slow for grasping and moving huge amounts of materials of unpredictable shapes, sizes and consistencies, says Prof. Stolkin. To overcome this problem, the team developed an autonomous, vision-guided robot which uses AI to assist the human operator. The system uses AI for automatic vision, allowing the robot to know how to detect, recognise and pick up all kinds of objects. ‘The robot (AI) is doing all the hard work, but the human still feels in charge at some level,’ he said. When the robot arm touches a surface or grasps an object, the operator feels the contact forces through the robotic glove. Giving remote operators situational awareness of what’s going on inside the no-go zone through a virtual sense of touch is extremely useful, says Prof. Stolkin. For the gloves to work, the robot arm must behave adaptively, responding to the environment they encounter, he says. To achieve this, the CEA team developed adaptive mechanisms in the arm joints that mechanically move just like springs and are more resilient against radiation than delicate electronic parts. ‘When we proposed this, the idea of AI-controlled robots, it was considered absurd by this industry,’ he said.